Four powers discover new lands full of resources and opportunities. The Romans, Barbarians, Egyptians and Japanese - they all send settlers to expand the borders of their empires. Soon the area becomes too small for everyone and war begins! 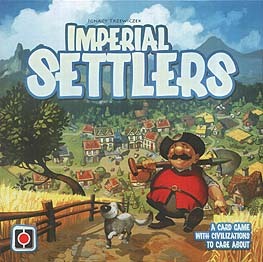 Imperial settlers is a card game that gives players control over one of four mighty civilizations. There are five rounds to explore new lands,build buildings, produce and trade resources, conquer enemies, and thus score victory points. The settlers are on their way, Lead them to victory!